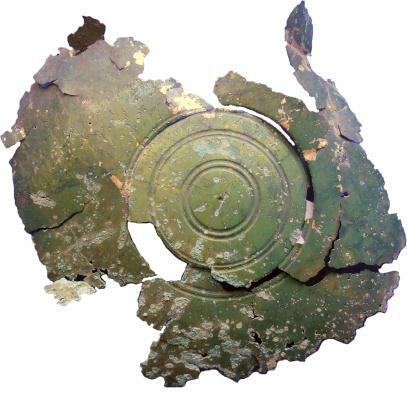 In late 2003, a Roman copper alloy vessel was discovered in a stubble field near Auldearn. Although fragmentary, the dipper was 80% complete. 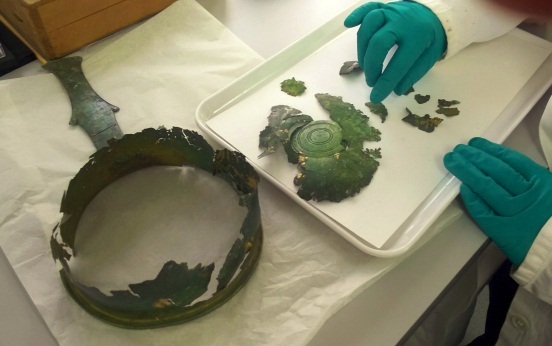 This exciting find was reported as Treasure Trove, and taken down to National Museums Scotland in Edinburgh, where it underwent preliminary cleaning, analysis and research. 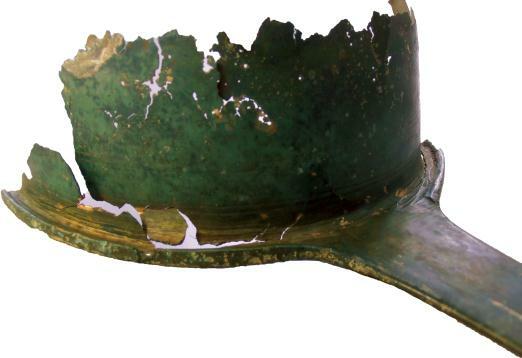 The vessel was identified as a Roman wine dipper, from the 2nd century AD. Analysis confirmed the metal composition to be a high tin bronze. The wine dipper was allocated to Inverness Museum & Art Gallery where it was kept in storage in a dry atmosphere with silica gel, until it could be treated. It is thought that the dipper may have been hit by a plough while in the ground, causing fractures to the handle and further distortion and damage to the fragile bowl. The surface of the metal also had numerous scratches and some loss of patina revealing clean bright metal, probably as a response to twisting and stress. All the individual pieces were photographed and examined under the microscope to assess their condition. Some areas of the dipper were stable, whilst other areas, especially the bowl were affected by pitting and perforation caused by active bronze disease, a chemical reaction with moisture that converts the metal to a pale whitish green powder. It is called ‘bronze disease’ because the chemical reaction acts in a similar manner eating away at the bronze until there is no metal left. It was important to stabilise the affected metal, remove loose corrosion and stop the progress of the chemical reaction that produces the bronze disease. During the cleaning and stabilisation process, a number of new holes through the thin bronze were revealed, and some existing ones grew in size. 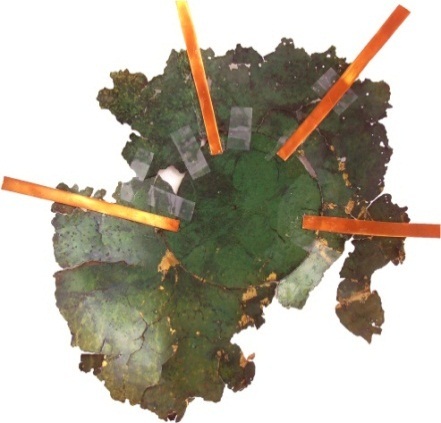 The bronze fragments were then stabilised by treatment with a solution that acts as a moisture barrier and inhibits the chemical reaction between atmospheric moisture and the unstable corrosion. After this process, the fragments were lacquered and were ready for reconstruction. The fragments were composed of thin metal and have no substantial edges that can be secured without some form of additional support. The dipper fragments were initially taped together with just to hold them all in correct alignment. Then copper foil strips were applied with a chemically stable, but reversible adhesive to ‘stitch’ the pieces together. The adhesive also acts as an additional separation layer between the surface of the bronze and the copper foil. The base of the bowl was assembled separately to main body of the dipper, there is only one small area where they tenuously connect. This reconstruction was for display purposes and the adhesives used are reversible. The condition of the dipper will be monitored to check that the stabilisation treatment has been successful. The dipper is on display at Inverness Museum & Art Gallery in the Roman Iron Age case.